Version 1.2 (V 3.2 for the free version) now available, with some features that some of you have requested (month navigation box in agenda view) and some small bug fixes (css file copying for some setups and event durations < 1 hr on php 5.3). If you are php 5.3, please upgrade to this version. 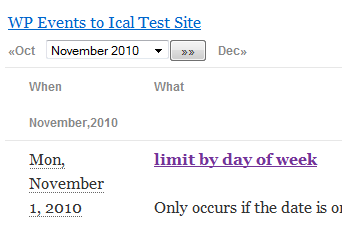 Minor bug fix for php 5.3 users that caused 0 durations to be displayed (0 weeks, 0 days etc) and weirdly meant you could not create events less than 1 hour. In the interim, systems on php 5.3 will not use the php 5.3 code, but will use the same code as php 5.2.x as that I know is robust! Added option to include the ‘box calendar’ month year navigation in the agenda view. Add show_month_nav=1 (or true) in the shortcode parameters. To avoid unrequested changes for existing users, in agenda view, the month navigation will not show unless you add the parameter. It will show in the calendar view. Download link for standard css file to make it quicker for you to edit it. Added to css file to attempt to make default css apply to more themes. Since some themes are quiet different this may not always succeed. The css is quite verbose as a result to cater for those who are not so css competent. If you are pedantic about this, please create a custom css and thin it down. 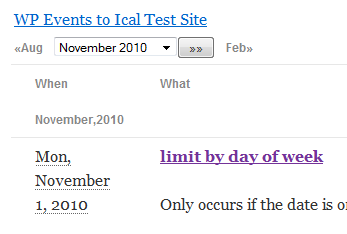 I had a right royal battle with IE on the css trying to get rid of table borders where one does not want them! Seems one needs to reset borders on tbody, as well as possibly a bunch of others! You can specify multiple months in the agenda view and the month navigation will let you jump multiple months at a time!